Smart protection for your home. You’re looking to protect your home and family with ease and confidence. Protecting your business or commercial property is essential and multifaceted. ARM Security Systems has the right technology and expertise for the job. Receive help at the touch of a button, with 24/7 assistance even if you live alone. A variety of solutions and plans are out there. Awesome alarm company. The techs and support staff are very responsive. Great experience…friendly service, very nice people. I would highly recommend them to anyone. Fast, excellent work. Highly recommend. Our family is here to protect yours. ARM Security Systems has served thousands of homes and businesses in the greater Maryland communities with protection from burglary, fire, intrusion and more. You get the latest in digital technologies to safeguard and monitor your most precious things, with easy access and control. All of this is backed by the personalized, professional expertise of a highly qualified team of technicians and support staff. ARM Security Systems will recommend a customized solution for your home or business, based on your important security requirements and budget. 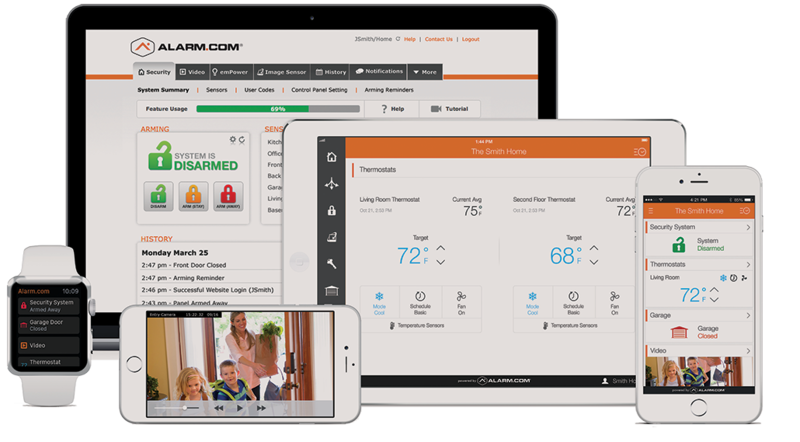 We offer solutions form Alarm.com, best-in-class security plus smart automation tools for your home or business. Trusted by over 5 million, with an A+ Better Business Bureau rating, Alarm.com agents are committed to delivering better products at the highest level of customer service. ARM Security Systems is also an approved Honeywell Security products dealer which affords you the highest quality components and years of trouble-free customer care. Honeywell is a leading global manufacturer of security and automation solutions for residential and commercial applications, from intrusion, fire and home automation systems, to the latest in IP video and access control. Honeywell is focused on technologies that create “connected” homes and buildings.